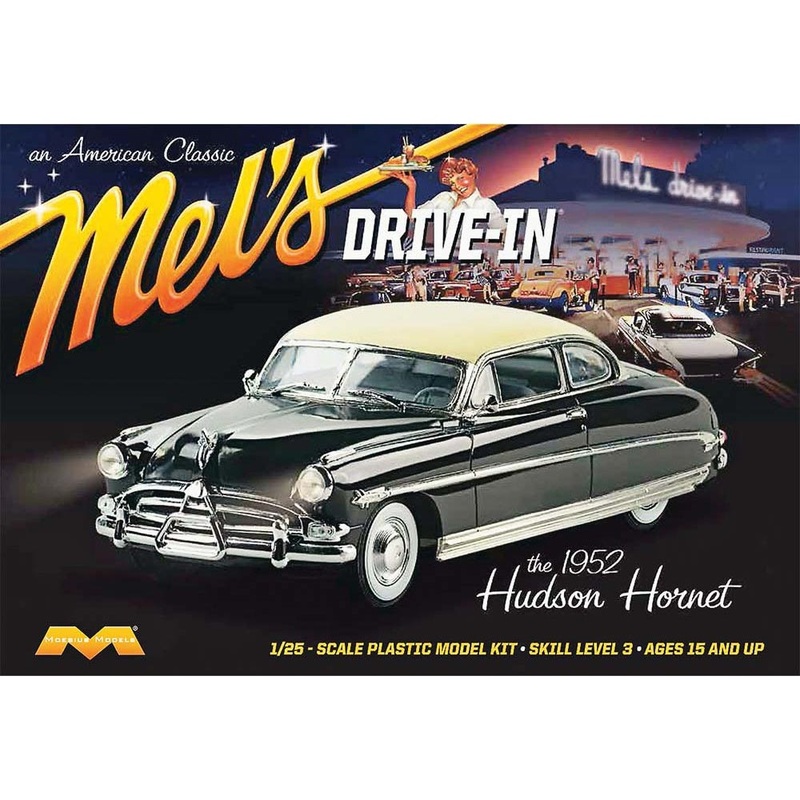 Mel's was America's first and most iconic drive-in restaurant. Originating in the pleasant California climate of San Francisco in 1947, the eateries sported interiors with cozy booth seating, diner style Formica and polished chrome decors; while outdoors, patrons were served at their automobiles by stylishly uniformed car-hops. Sleek and streamlined, with hidden rear wheels, a 308 cu. in. engine and dual single barrel carburetors standard, the '52 Hudson Hornet's step-down chassis, lowered body and floor pan, gave the car both a functional and stylish lower center of gravity. It handled well and provided a sumptuous ride. Moebius brings you the vehicle that inspired the Disney Pixar film Cars character "Doc Hudson", and dotted the parking lots of Mel's and drive-in restaurants across America. This highly detailed plastic model kit features pieces molded in light gray, clear and chromed plastic.